Amberian Dawn formed in 2006 in Finland, originally with a male singer. After making a demo, composer Tuomas Seppälä realised that this wasn’t right for the music and they instead hired lyrical soprano vocalist Heidi Parviainen. Their first full-length album, River of Tuoni, was released in 2008. They followed this up with The Clouds of Northland Thunder (2009), End of Eden (2010) and Circus Black (2012). Shortly afterwards, they announced the departure of Heidi (who has since gone on to form Dark Sarah) and their drummer and guitarist, who were then replaced by returning former members. The band’s search for a new singer found Päivi "Capri" Virkkunen, with whom they re-recorded many of their former tracks – released as the album Re-Evolution in 2013. Now the Finnish symphonic metallers are back with Magic Forest, an album that began its life with crowdfunding before being picked up by Napalm Records. Perhaps the most obvious and easiest comparison is with Nightwish, and it’s one that the band seems to both avoid and court in equal measure – they’ve denied that there’s “any real connection”, but just looking at Tuomas Seppälä playing keyboard in a top hat in their latest video will probably give you other ideas. Their sound certainly has a lot of similarities to pre-Century Child Nightwish, (and swapping an operatic-style singer for a rockier one is a familiar story too) but they are still unique enough to stand on their own. Opener Cherish My Memory is fun and catchy, straight away showing you the new direction the band are taking. There’s more of a focus on synths and keyboards with Capri’s versatile vocals front and centre. The band has noted an inspiration from Abba and bands from the 80s, and that comes across pretty plainly in the chorus, which is sure to have you singing along. I’m Still Here continues in the same vein, though it seems a little darker and less perky. And then there’s Warning, which has an excellent drum opening and is a bit heavier than the other tracks. Magic Forest is the lead single from the album, and it’s easy to see why. It’s joyous and refreshing, and pretty likely to get stuck in your head. The interludes where Capri sings about songbirds are a little out of place, but they do bring a bit of Disney magic to the proceedings. It’s also the first track where the orchestral parts are more prominent, and it works very well. In a way it would be nice to see them going even further down the orchestral route. Dance Of Life follows, another fairly upbeat song that’s pretty and has a great chorus. But again, there’s not much variation here. By the time you get to Agonizing Night, it becomes clear that Amberian Dawn have found their comfort zone and are sticking to it. If you like the style you’ll be happy, but there’s definitely room for more experimentation. Son Of Rainbow is oddly titled (anyone else reminded of the film Son of Rambow?) but it’s pretty enjoyable, with Capri’s passionate vocals really carrying it once again. It’s a bit more power metal tinged, with some almost duelling guitars in the middle. Then we have something a little more unexpected in Memorial, a duet with guest vocals from a male opera singer: Markus Nieminen, who previously worked with the band on the song Virvatulen Laulu. This song is probably a bit of an acquired taste, but the two voices go well together and it makes for an interesting track. The album is fairly short, so we’re at the penultimate song already with Endless Silence. It’s a surprisingly happy-sounding song given that the lyrics seem to be lamenting a loss of innocence. The ending is strong with some good guitar work, leading us finally to Green-Eyed. This is the only slow ballad on the album, and it’s brilliant. The orchestra is used to great effect, Capri’s vocals sound better than ever and the whole thing just has this creepy atmosphere that seeps into your mind. When it came to an end, it left me wishing that there were more tracks like this on the album. 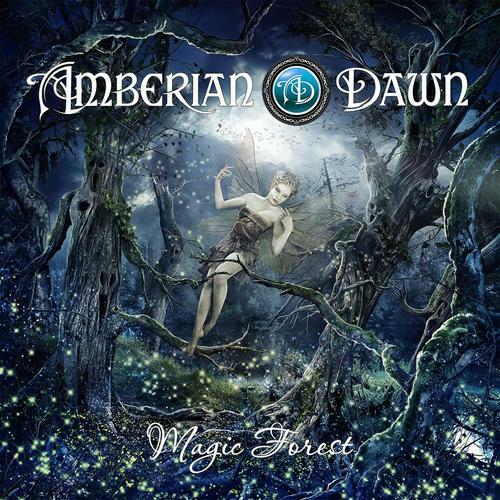 Magic Forest is a valiant effort from Amberian Dawn, and one that will surely gain them new fans with Capri’s voice. At the moment they’re sticking to one style a bit too rigidly, yet they’ve proved that they can do faster songs and ballads really well – so it would be great to see them mix it up a lot more in future. Nevertheless, this would be a good addition to any symphonic metal collection.